hey there, friend, a photo by eatzycath on Flickr. 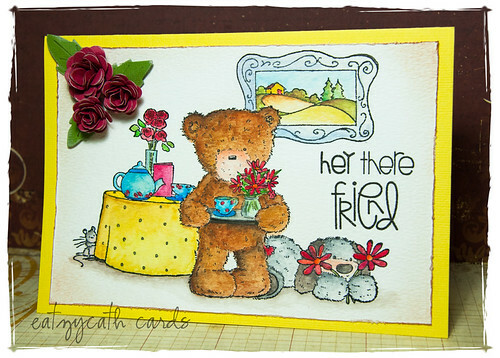 I love Popcorn the Bear stamps, but I must say that the images are a challenge to color.... especially the furry shades of brown, yellow and orange. This stamped image is actually a combination of 4 stamps, with some masking work done on the bear, to position the picture frame, table and teaset, and finally the lying dog just behind the bear - the positioning of the stamped images was made a little easier with the help of a stamp positioner - a nifty little gadget that is very useful especially when combining stamped images. Coloring was done using Caran D'ache NeoColor II wax-based water-soluble pastels - love the vivid colors of the pigments. What an adorable card Catherine! Popcorn is such a fun guy to color and you really did a marvalous job! Thank you for joining us this month at Crafter's Companion for our animal challenge! Fabulous masking, and what great coloring ... I really like how you did his fur ... so glad you joined us at Crafter's Companion.